So you are thinking about buying a Jaguar XK-E. What first caught your eye? The timeless lines? The power and speed? The handling? The E-type has all of these things and more. It embodied the emotions of the 60s and gave the world a car with styling and performance unmatched by other European sports cars at twice the price. The car did not magically appear overnight but was the materialization of decades of evolution and years of racing experience with the C and D types. With its near perfect aerodynamic bodystyle and whiplash performance, it is no wonder that an E-type is in the Smithsonian as a permanent exhibit. But is an E-type right for you? They are not for the weak of heart. Like any other sports car between 25 and 40 years old, it requires maintenance and care at much higher levels than today's car. You can not judge them based on today's cars. If you compare them with antique Ferrari, Maserati, Lotus, Lamborghini, or some of the other high-performance sports car of the era, and you will find that the maintenance is comparable if not Spartan. Don't let any negative press fool you either, a well maintained E-type is a very sturdy and reliable car. The biggest complaint most have revolves around the Lucas electrical system (as do most of the complaints of early British cars), but this again is not an issue if properly maintained. But remember, this is not a Buick or Chevy and should be purchased with open eyes. As an investment, I do not recommend it. To get a Concours quality car, you can easily spend $50K to $75K in the renovation. This is not a good return when you consider that you may only be able to get $45K to $50K if you were to sell it. Very few have made money on the E-types except maybe for a handful of dealers that create "bondo-bombs" and sell them overseas. The two biggest pieces of advice if you are looking to get one for long-term ownership is to spend more and get a sound car with minimal needs, and do most of the work yourself. As a restoration project, it is daunting. Restorations stretching over a decade are not unheard of. If you have never done one before and want to take a non-runner and transform it into the car of your dreams, expect to take 3 times longer and 5 times more money than you are budgeting. Parts for these cats are not cheap and the availability of knowledgeable mechanics that can correctly work on them is scarce. So unless you have money to burn, are a competent mechanic, or have time and a lust to learn, steer clear of the restoration projects and buy a runner with no rust. As a labor of love, you can't beat it. If you truly love the classic lines and performance of the car, you can not find a better hobby. The car is distinct. The world had never seen the likes of it before and may never again. 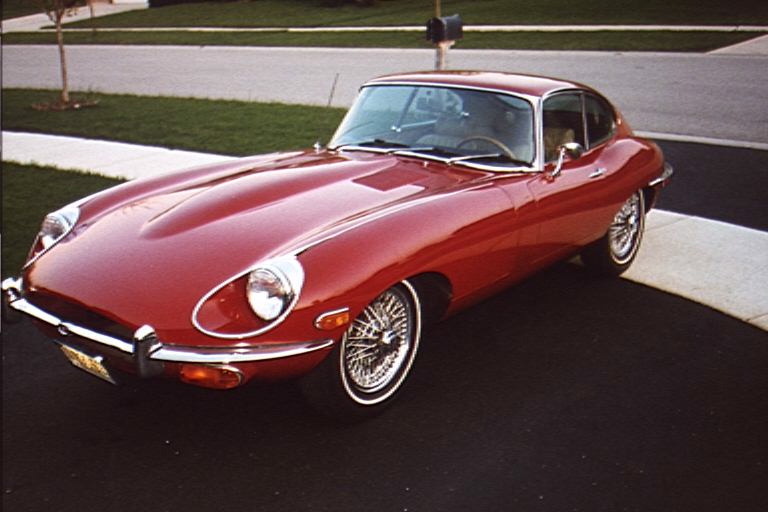 If what you are looking for is just a nice looking sports car, but do not have the interest or money necessary to own and maintain an E-type, do yourself a favor and buy one of the many new cars. You will be happier in the long run and may save a classic to boot. However, if you have the money to buy one in good condition ($20-$50K) and don't mind tinkering, you are in for one great ride. Still interested? Let's get down to brass tacks and equip yourself with the knowledge necessary to not get burned. The three main things to look for when buying an E-type are rust, rust, and rust. Not only do the elements work against any antique car, some E-types came over the ocean on the decks of the freighters exposed to salt water, some were not undercoated, and none were galvanized. In addition to that, since they are so collectable, many previous owners with high aspirations have started restoration projects and left their cars exposed to moisture or the elements. Other than the easy to see body rust, the main areas that are the common rust areas include the floor pans, the wheel well areas, the rear suspension where the radius arms bolt into the body, the outer sills (between the door and the hood), and under the battery. Other areas that are key structural areas to look for include the lower rear panel assembly (the panel under the rear gas tank), the front dash assembly where the front frame meets the shell. When checking for rust, use a magnet wrapped in cloth (so as not to scratch the paint) and run it over the body. Where the magnet does not stick is an area where plastic filler had been used. This is not, however, full proof since there are metal impregnated plastic fillers out there. Also you can rap with your knuckle on key areas to see if you get a shower of rust. Plastic filler is not necessarily bad. Many times it can be used to even out dent repairs and other imperfections. However, if it was used over improperly treated rust, the repair may look great when you get it but the rust will return in 6 months. Be especially suspicious of recent paint jobs. Replacement or welded panels are always the best long-term option. If you are looking to purchase for an investment, be very careful to check the vehicle's originality. A lot could have happened to the car over the last few decades where previous owners have used various un-authentic parts. You may elect to purchase an E-Type that has been converted (Ford/Chevy engine transplant or a roadster converted from a coupe or 2+2) but the long-term value will be less. Look at the next section, "Identifying the type, history, and authenticity" to verify the authenticity of any car you are looking at purchasing. Be very careful to check out all of the electrical items. A headlight that won't come on, a blinker that won't work, and other apparently small items can be a significant hassle later to fix. When you get ready to crank it over (if possible) listen to the electric fuel pump click (it should go for less than 1 minute and stop once it has achieved pressure). Check all gauges. Turn the engine by hand first to see if it has been frozen by rust (can you say engine rebuild?). Take off a wheel and look at the condition of the brake rotors and calipers. If questionable, always elect to rebuild. New master cylinder rebuilds are quite common. Check the fluids to see if you can see any separation and condensation. 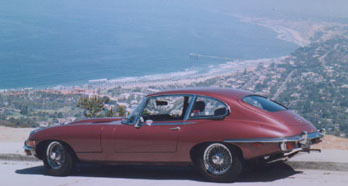 There were three XK E-type Series. Series I, II, and III. Some classify the E-types that were made during the transitional period between the 1st and 2nd Series as a Series 1 1/2. The 1 1/2 designation was not one given by Jaguar but rather by the owners. Distinguishing Features - The most distinguishing feature from a distance is the covered headlight. (covered by a glass lens). The turn signals were above the bumpers. Power Train - The engine was a straight 6 cylinder with twin polish aluminum valve covers that came in a 3.8 litre from 1961 to 1964, and 4.2 litre engine from 1965 to 1967. Generally, with the exception of a rare few, the 3.8 litre came with a 4 speed non-syncro transmission, and the 4.2 came with a 4 speed all syncromesh transmission. Many of the 4.2 litre 2+2s came with a 3 speed automatic transmission. All came with three SU carburetors. Rack & pinion steering. Body Styles - The 3.8 litre came in the roadster (convertible) and FHC (hardtop) versions. The 4.2 came in the roadster and FHC also, but added the 2+2 (meant to be a family car, longer with small rear seats) in 1966. All had wire wheels, and bios ply tires. Interior - The most significant feature about the series I was the toggle switches. The 3.8 litre had a dotted aluminum center panel and the 4.2 had a black textured finish. Both had an ignition key slot and then a button you pushed to start the car. This was a very confused year since Jaguar was converting the E-type to conform to US Federal Regulations. Some of the features of the Series I were combined with the Series II. Distinguishing Features - Most had uncovered headlights. The turn signals were still above the bumpers. Power Train - Same as Series I 4.2 litre. Except that the three SU carburetors were replaced by two Zenith Stromberg carburetors. The valve covers had ridges rather than being smooth. Body Styles - The same as the Series I 4.2 litre. Interior - The same as the Series I 4.2 litre except that the dipper switches were replaced by rocker switches. 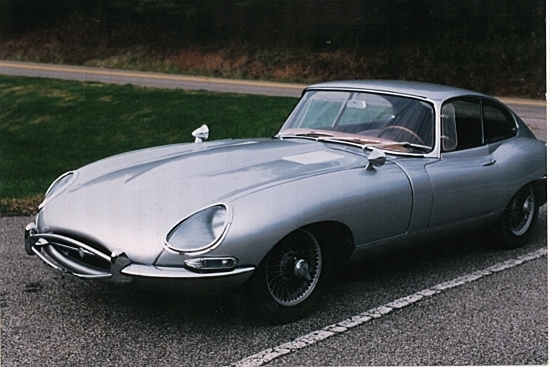 This was a very short series that really spelled the end for the six cylinder E-Type. 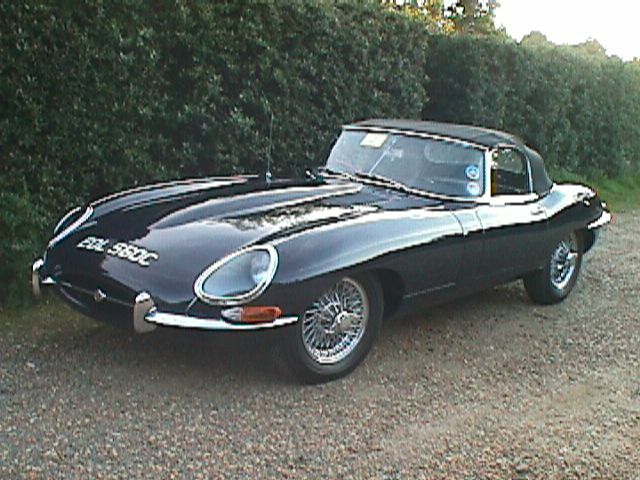 The amount of emission controls and features such as air conditioning sapped the venerable power of the E-Type and Jaguar knew they had to replace the power plant soon. Many owners have retrofitted their Series IIs with SU carburetors to get back some of the lost power. Distinguishing Features - Uncovered headlights. The turn signals were now below the bumpers. Power Train - Same as Series I 4.2 litre. Two Zenith Stromberg carburetors. The valve covers had ridges rather than being smooth. Air conditioning was offered. Body Styles - The same as the Series I 4.2 litre. However, the 2+2 style windshield had a greater rake. Many also had a strut on the bonnet to help with opening. The rear bumper was now a one-piece wrap-around. Power Train - A V12 5.3 litre with 4 Zenith carburetors. Air conditioning was common. Power assisted steering standard on both models. Body Styles - Roadster and 2+2. The Roadster was in production until late 1974 and the 2+2 was dropped a year earlier. The most important thing is to verify all the numbers match. The car's identification numbers are located on a stamped plate located on the passenger side below the fuel bowl/filter. The key ones you want to check are the engine number and the car number. The engine number should also be located on the right-hand side of the engine block above the oil filter and on the front of the cylinder head. The car number should be located under the rear license plate and on the picture frame (the top of the square box frame at the front of the front engine frame behind the radiator). If you are really serious, you can also check the transmission number, which can sometimes be seen through the access panel of the transmission tunnel on the driver's side. Lastly, if you are purchasing the car as an investment, you should purchase a book with detailed information about the E-type and familiarize yourself with it. A picture is worth a thousand words. 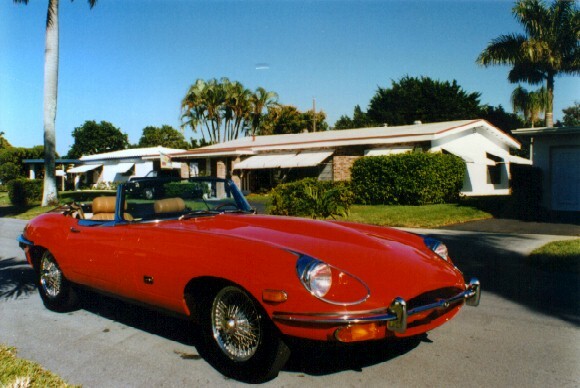 One excellent resource is Philip Porter's Original Jaguar E-Type published by BayView Books (ISBM 1-870979-12-5). Other books are referenced in the book and reference section. The following are only approximate street prices. There is nothing that can substitute for common sense and experience. Series 1 1/2 are roughly the same as Series I. Very Rough is non-drivable and needs a major restoration and usually very rusty. Running has some rust, shows visible wear, and needs restoration, but the vehicle is sound, everything functions, and the vehicle runs. Nice is a clean vehicle with some wear, no visible rust, runs and drives well, and only needs minor work (can be enjoyed as is or a good candidate for a restoration for a beginner). Very Nice is a sharp vehicle and good driver that could needs no work done on it but still not in mint or pristine condition. Mint/Pristine is a complete perfect restoration, or an extremely original mint condition car that would be a 97+ point Concours show-quality car. Deduct 10% if automatic and 5% if non-wire wheels.